UPGRADE YOUR SCAR TO THE LONG RANGE FLAT SHOOTING 224 VALKYRIE. NEW HDD 224 VALKYRIE CALIBER CONVERSION FOR THE SCAR 16. KIT COMES WITH YOUR CHOICE OF 16", 18" OR 20" STAINLESS BLACKED 224 VALKYRIE BARREL WITH 1in7 TWIST, 224 VALKYRIE BOLT ASSEMBLY, 25RND MAGAZINE AND HDD SCAR BUFFER. NO PERMANENT MODIFICATIONS TO YOUR SCAR, 10 MINUTES TO INSTALL OR SWAP BACK TO 556. MUZZLE IS THREADED 1/2X28. 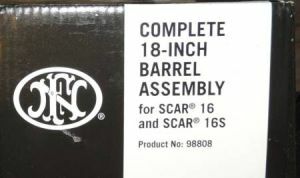 BARREL LENGTH: (Required) -- Please Select --20"18"16"